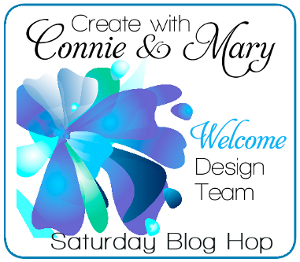 If you are going forward in the hop you arrived here from my friend and partner Connie Babbert and her Inkspired Treasures blog. Her card is just delightful! Don’t you just LOVE this set? I know that I do and so does all our design team members. A couple weeks ago we had a color challenge of Hello Honey, Sahara Sand and Basic Black. I just LOVED this color combo and when I was trying to figure out what colors to use for my card today, I decided to go with this combo. Whisper White – 4 1/4 x 5 1/2, run through large dotted folder. Wrap piece of Hello Honey Stitched Satin Ribbon. Wrap two pieces of Basic Black 1/8″ Taffeta Ribbon. Add Sahara Sand 3/16″ x 4 1/4 strips. Add panel to card front. Whisper White – 2 3/4 x 4 1/4. Stamp Blossom in Hello Honey, Hello Honey stamped off once, So Saffron stamped off once. Add stem to block curling top in opposite direction. Stamp detail in Sahara Sand full strength and solid image stamped off once. Stamp greeting using Memento Black. 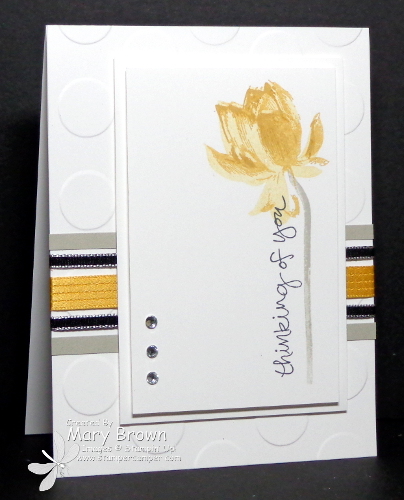 Whisper White – 3 x 4 1/2, add stamped panel using dimensionals. Add to care front using dimensionals. This entry was posted in Create with Connie and Mary, Sale-a-bration, Saturday Blog Hop and tagged Lotus Blossom, Sheltering Tree. Bookmark the permalink. Love how you designed this & the colors used! Beautiful & elegant! I love this card (of course I am a big fan of all of your work) but I wonder how the inside of the card looks when you wrap the ribbon around the cover. Do you have a trick for hiding the ends inside the card? Peggy — When I want to do that and not have the ribbon show on the inside of the card, I just add an extra panel. If you look at the “here’s the details’ – it shows a 4 1/4 x 5 1/2 panel. I add the ribbons to that and then add that panel to the front so the ribbons don’t how inside. Very pretty and love the ribbon with the paper strips!